Notes: I own this one. Once upon a time there existed a world that held magic until it was suddenly taken away. Now, hundreds of years later, the kingdom is in turmoil as a power struggle is about to ensue, and four individuals will hold key roles in how it will all play out. Kaladin was studying to be a surgeon when fate sent him on a very different path. Shallan seeks an apprentice with Jasnah Kholin, but is hiding her true agenda, and it is not an altogether honorable one. Delinar is a high prince and honorable man who vows to protect the present king, his nephew. Szeth is an assassin who hates what he is, but sees no way out. They saw one person can make a difference, but four? Four can change the world. The question is for the better or worse? 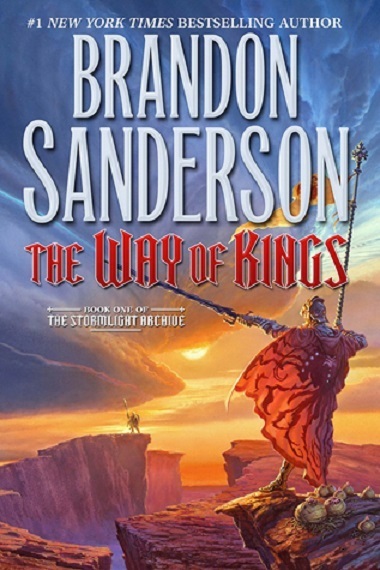 The Way of Kings showcases Mr. Sanderson's wonderful imagination. The world building is phenomenal with Shardbearers (people who wield Shardblades and Shardplates--magical types of swords and armor which make the bearer practically indestructible and unstoppable), Spren ('spirits' that "are the heart of change, and therefore the heart of all things. "), and the Lost Knights of Radiance (men who were trained by the heralds to protect the weak, but allegedly betrayed mankind after the heralds abandoned man. No one, however, knows exactly how). There is a lot to take in but it is well worth it. The book starts off rather choppily and the beginning was slightly confusing because both the prelude and prologue seemed rather distant from the rest of the book. You'll realize why these scenes are important and what Mr. Sanderson was showing you later, so don't feel bad if, like me, you start off a bit confused. Just read it and tuck that bit of the story in the back of your mind and revisit it later. I recommend reading both the prologue and prelude again after finishing this book, but right before reading the next book in the series, 'Words of Radiance'. Szeth, who is mentioned in the prologue, will be more important later on and it will make more sense then. Two Herald names from the prelude to keep track of are Talenel "Taln" and Jezrien (king of the Heralds). The author at times seemed rather long winded, but don't be daunted by it. In this book he is setting the scene and building up to something epic. He is also introducing us to all the main characters and giving us insight into their personalities and character. As Martin Luther King, Jr. once said, "The ultimate measure of a man is not where he stands in moments of comfort and convenience, but where he stands at times of challenge and controversy." Brandon Sanderson puts his characters to the extreme, and while some are found lacking, the heroes of the novel begin to show their true colors and stand out in this one. What I love about this book is that you see the characters grow and morph as they jump hurdles, work through difficult and sometimes unbearable situations, and occasionally defy the odds. Helen Keller once said, "Character cannot be developed in ease and quiet. Only through experience of trial and suffering can the soul be strengthened, vision cleared, ambition inspired, and success achieved." and Abraham Lincoln once said, "Nearly all men can stand adversity, but if you want to test a man's character, give him power." Kaladin is by far my favorite character, and I can't help but wonder if Mr. Sanderson kept these two quotes in mind when he created him.